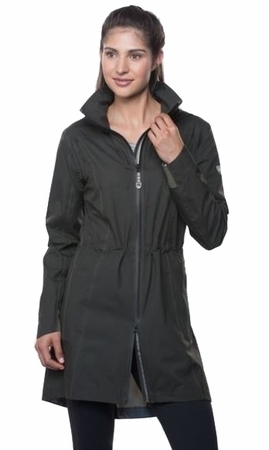 "The KÜHL W'S JETSTREAM TRENCH is a lightweight, high performance rain jacket made with AIRSKAPE fabric. This waterproof/breathable fabric boasts a 20K waterproof rating, 16K water vapor transportation, and a 2.5 layer 15 micron thick hydrophilic PU laminate with blue pearl finish. AIRSKAPE fabric has a clear hydrophilic membrane which absorbs and spreads out moisture allowing the fabric to dry faster. The pearl backer darkens as the water disperses before evaporating allowing you to see the technology working. The face is a woven nylon ripstop for mechanical stretch and strength. The surface has a soft hand and is extremely lightweight. All seams have been fully sealed, and the low profile, stretch cuffs seal out cold and wet. The YKK zippers are water resistant. The right pocket converts into a stuff sack with a reflective ribbon loop. KÜHL's signature hood has a reinforced brim and clean and sleek eye-lock for low profile adjustment. The W'S JETSTREAM TRENCH features a dropped back hem for extra coverage, and the center front zipper falls just above knee (34""). An internal draw cord adjusts at the waist for a custom fit. Custom KÜHL reflective ribbon at the inside draft flap and pockets provides better nighttime visibility.